This pumpkin pie martini is basically a pumpkin pie in a cocktail glass. 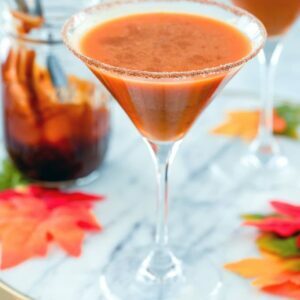 Made with pumpkin puree, vanilla vodka, and a pumpkin caramel syrup, it's a pumpkin cocktail that will have you in the fall spirit in no time! Mix pumpkin pie spice and sugar on a small plate. Moisten rim of glass (either with water or simple syrup) and roll in mixture to coat in pumpkin pie spice/sugar. In a shaker, combine the vodka, pumpkin pie puree, pumpkin caramel syrup (or caramel), and ice cubes. Shake well. Strain into prepared martini glass. Sprinkle more pumpkin pie spice over top. Place sugar in medium saucepan set over medium heat. Without stirring, let sugar melt until it's completely liquid and a light amber color. Remove pan from heat and pour in the warm water. The mixture will sizzle and bubble and some of the sugar may harden. if this happens, return saucepan to heat and simmer until mixture is liquid again. Pour syrup in jar or heat-proof bowl, mix in pumpkin pie spice, and let cool completely before using in cocktail.